AV and lighting control within everyone´s reach! LM 5 is not only dedicated to lighting control. 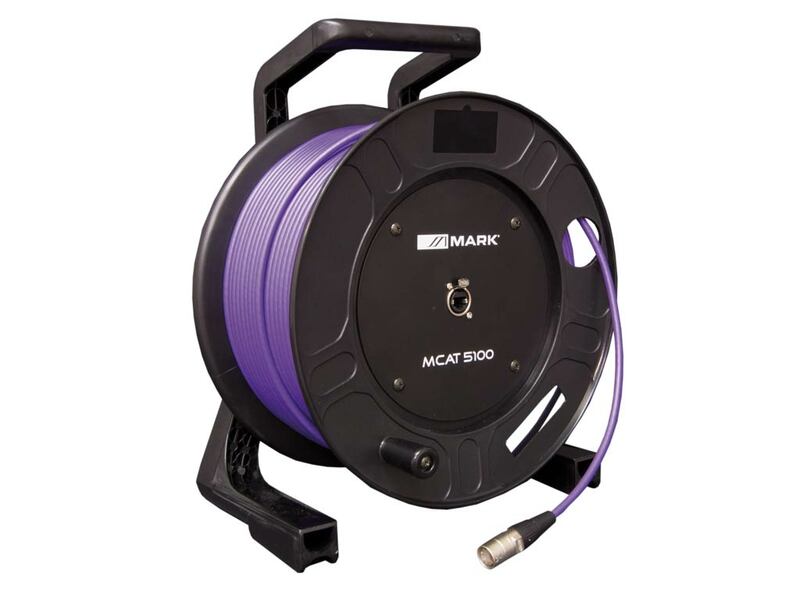 It is possible to manage audio, lighting and videos at the same time and for several zones of an installation. The overall installation can be controlled with a smartphone, a tablet or a computer. It is very intuitive so everyone can use it without any technical knowledge. 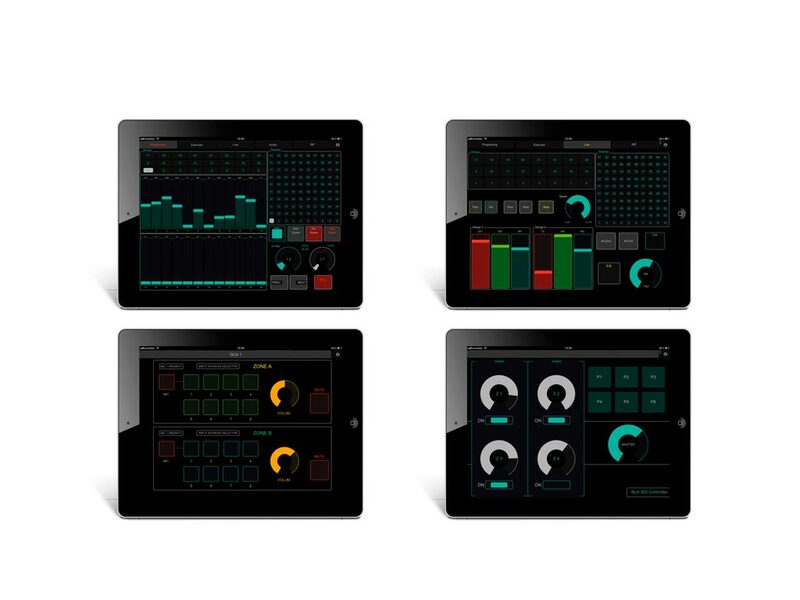 Thanks to the OSC open protocol (www.opensoundcontrol.org), it is suitable for mobile devices (iOS and Android) and PC&MAC computers: LM-5 turns your smartphone/tablet/computer into an intuitive console for audio and lighting purposes. Designed to suit all your needs! It is possible to edit layouts and create your own interface, totally adapted to the characteristics of your installations. Let´s imagine you are the owner of a restaurant and you want the waiters to control lighting (typical RGB installation). 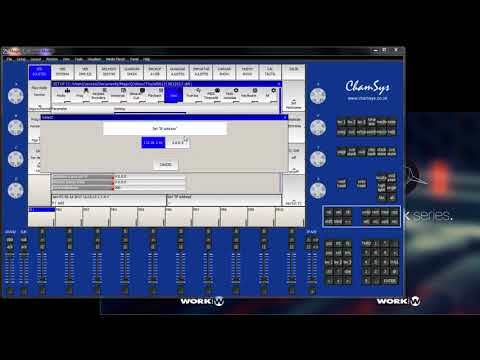 In this case, you can easily add 3 faders (R, G, B) to the interface, as well as a master and a blackout. 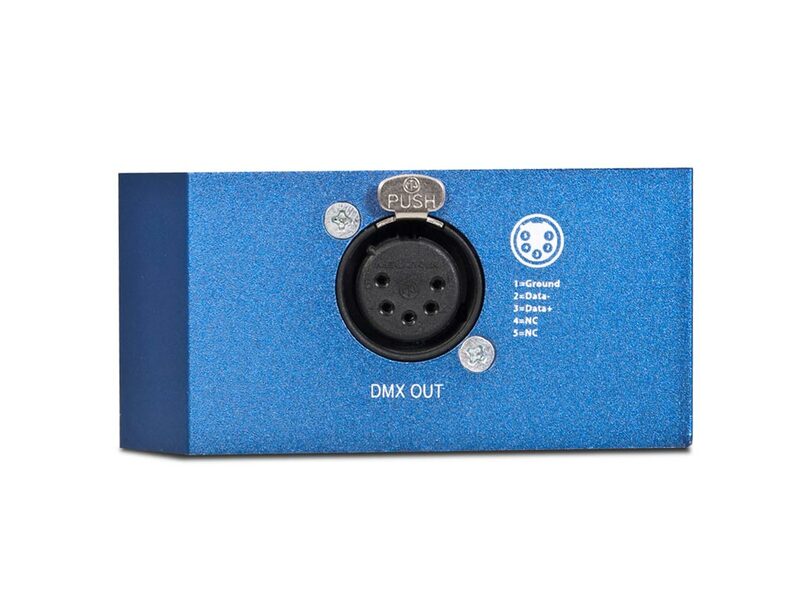 You can also control audio volume in a DMX compatible amplifier (like our SLA amps). It is easy to understand that another kind of installation (e.g. a small club, with moving lights and LED fixtures) would need another visual interface, and that is precisely the strength of LM 5: you can design your own interface to suit your needs! The Swiss knife for audio, AV and lighting control. 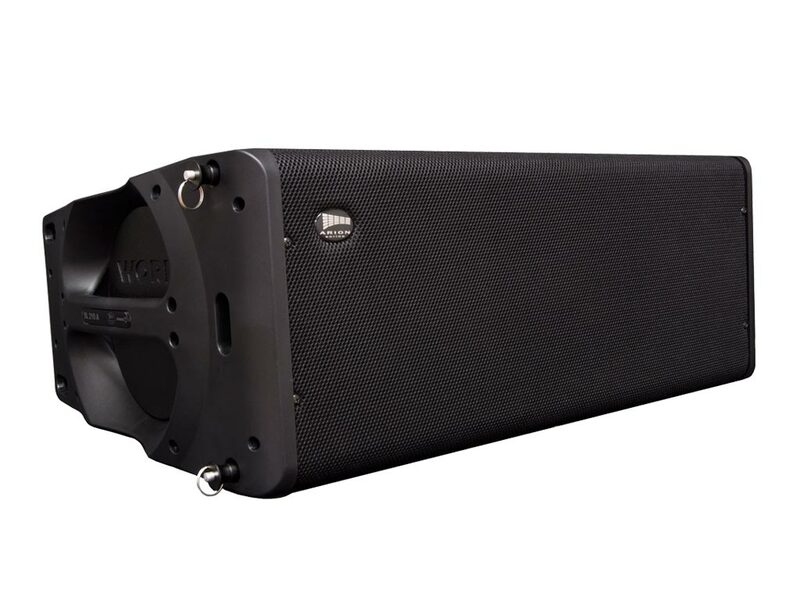 LM 5 goes much further and includes an internal memory to store 99 cues (with independent speed and fade time) and 24 cue lists, with up to 512 DMX channels. 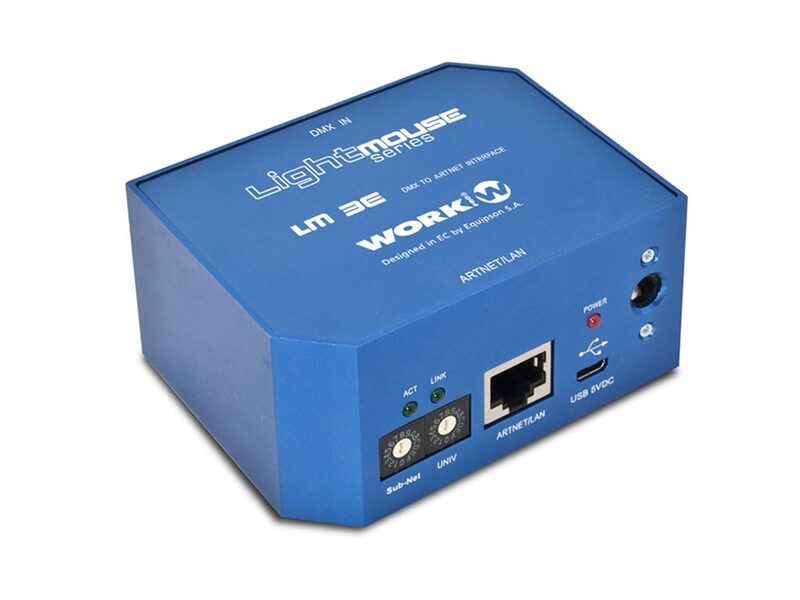 It is also a fully compatible ArtNet node (Ethernet to DMX interface) and it can be controlled by OSC server to create DMX data. 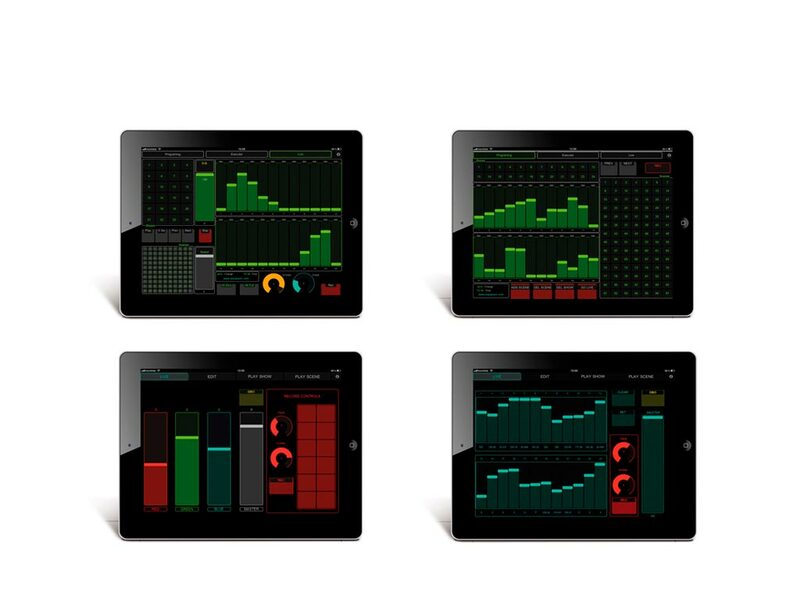 LM 5 is without a doubt the most intuitive tool to manage audio and lighting control in commercial installations, bars, small clubs and events. 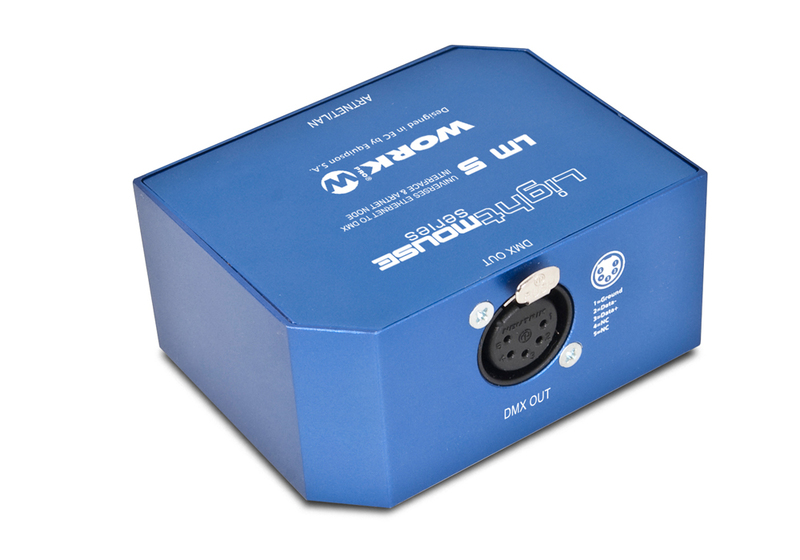 Plug & Play Ethernet-DMX receiver. 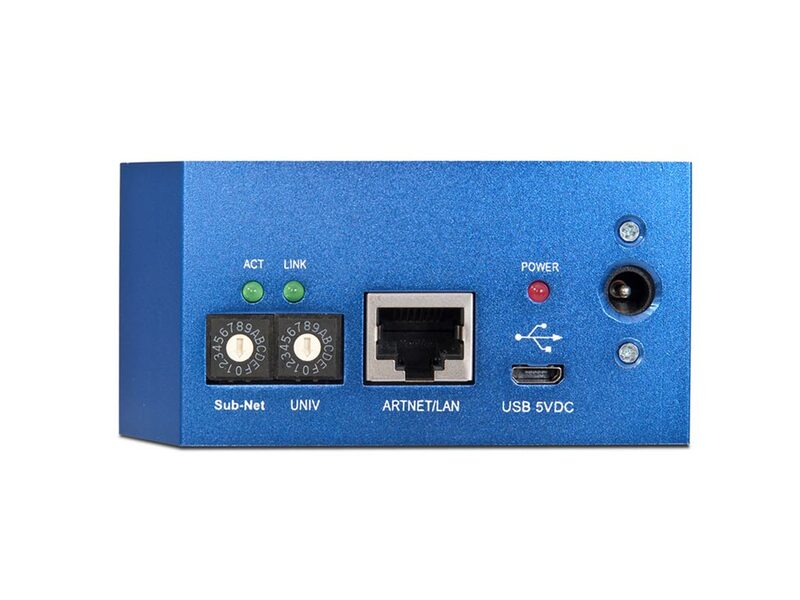 Ethernet interface with DMX recorder/player. 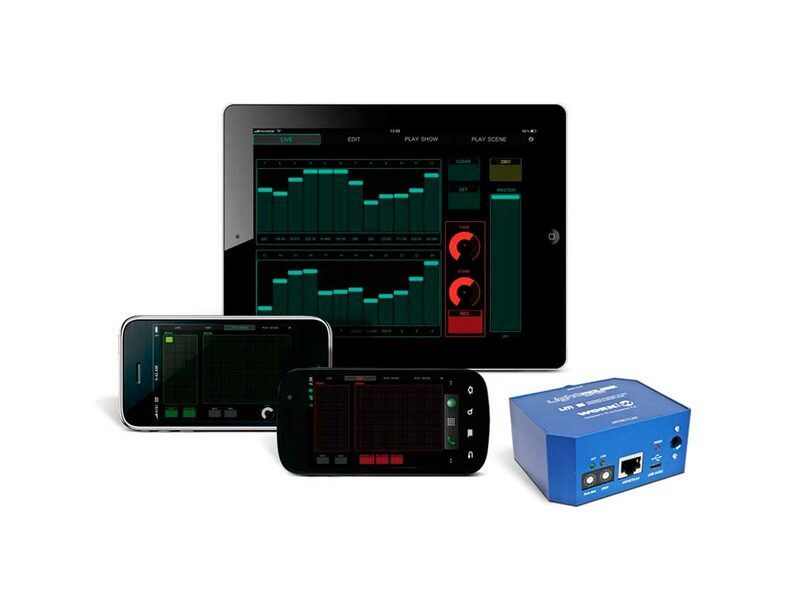 Control & program up to 512 channels by WiFi connexion from an iOS or Android device (Using OSC control apps). Built-in Memory to save and edit 99 cues (with independent speed and fade time) and 24 cue lists. Layout customization (third-party apps), to adapt the interface to user needs and installation requirements. Works as a compatible ArtNet node. Receives a better action´s feedback, editing and recording scenes or shows. 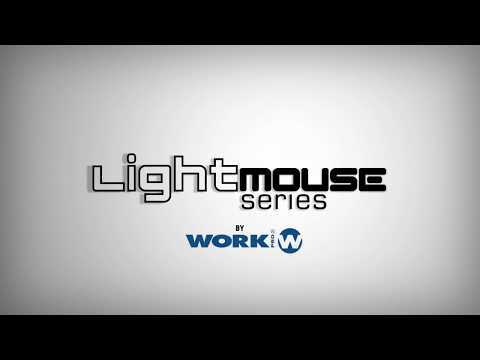 Live visual production programs / suitable for lighting control and audio edition. 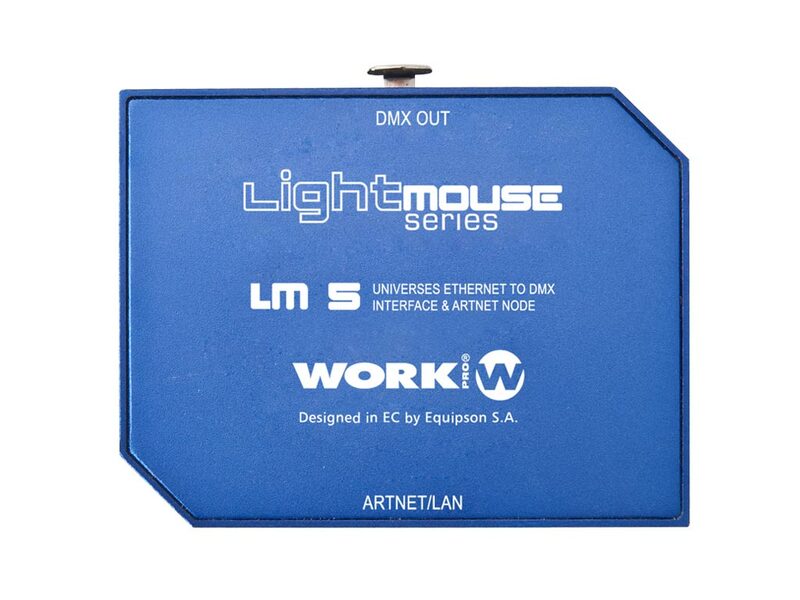 Fully compatible with LM 3E (DMX to Ethernet emitter). Dimensions (WxHxD): 86.3 x 42 x 67 mm. 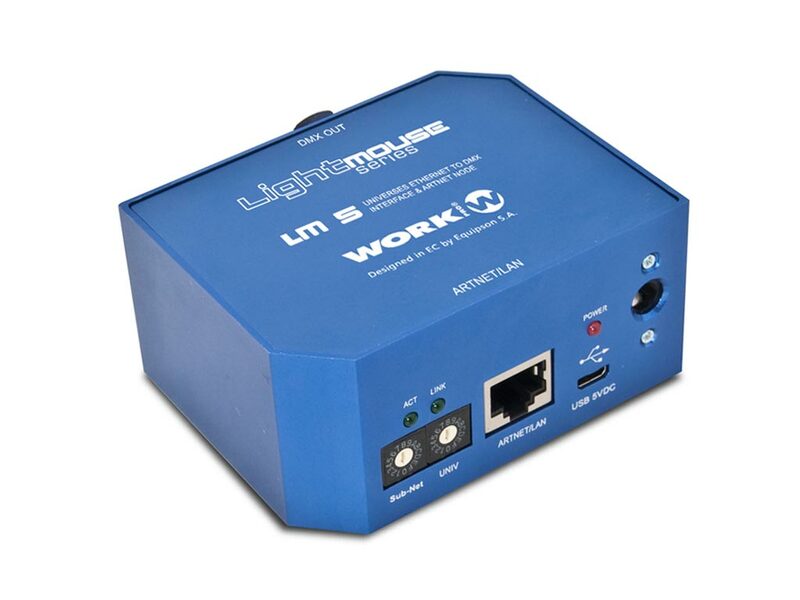 LM 5 Plug & Play Ethernet-DMX receiver.